← Blogging when I should be working…on H.W. Oh Big Lots, why do you lie? 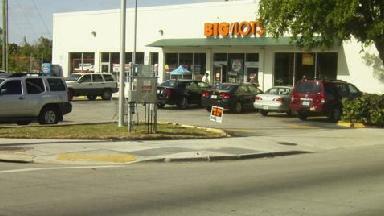 I am normally a big supporter of Big Lots, reasonable prices and great for outdoor/patio furniture. But there is one location in particular that I’m not a fan of. Maybe that’s because I had my credit card stolen there in back in July. It was taken from my purse, used at the store and put back in my purse. Guess it’s my fault for turning my back on my cart and leaving my purse inside. Silly me. Still, to say that I was surprised, is quite the understatement. I went back, immediately the same day, spoke to the manager there and explained the situation. He apologized again and again, saying this kind of thing had never happened before and if I could please refrain from complaining to the corporate office, then he would fix it and get to the bottom of this. He was very concerned that I would ruin his record with the company and somehow impact his position. Today, Fifth Third revered their credit due to the fact that Big Lots is claiming that the charge was valid, leaving me again without $100. Maybe I’m too young or just too naive, but I have to say that I really believed Mr. Sanchez when he told me he would fix it. That was the only reason I did not call the police and report it. But now, I find myself in quite a predicament. A situation where even my bank took their word for it, without even the slightest courtesy of contacting me. And here I thought I had a good relationship with my bank, I never go over my funds, I pay all their ridiculous ATM fees and I event participate in the occasional survey. I was under the impression that you signed your card, presented valid ID and signed your credit card receipts all so that these kind of things would not happen. I’m just not understanding how a credit card receipt without my signature is considered valid? Sis they review the cameras? Did they not notice that I made a cash purchase and never took out a card? Or that I stood at the front of the store with Mr. Sanchez for 30 minutes discussing the situation? All I can say is that I may be young and naive, but I never take this kind of thing lying down. I don’t know what kind of scam they have running at that store, but I have every intent to expose it. Word to the wise: If you go, to the Big Lots located at 2100 Southwest 27th Avenue, Miami, FL, just make sure to keep your purse closed and on you at ALL times.